I had some black gold glitter iron on that I wanted to try out and I thought it would look cool on something for Thanksgiving. I had some extra canvas banners sitting on my desk, that I actually ordered for a Christmas project that I will share soon. 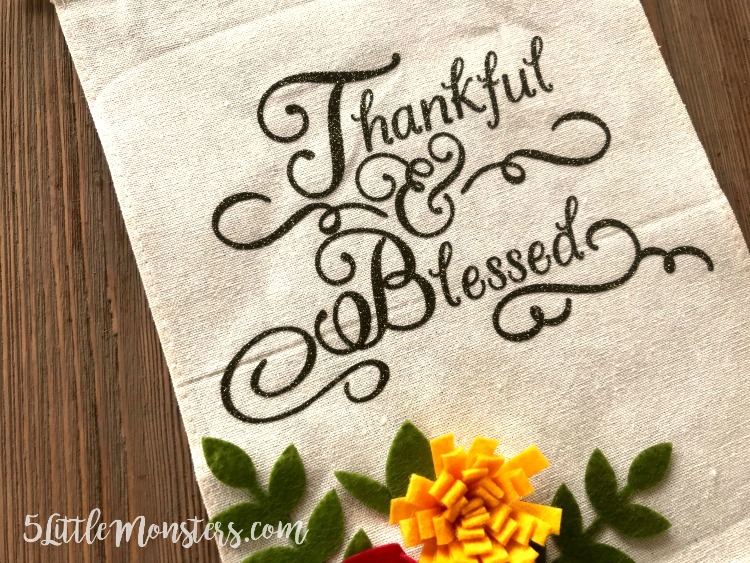 I came up with a design that said Thankful & Blessed, cut it out of the glitter iron on and pressed it on to the banner. It seemed pretty plain and I thought it needed something more. 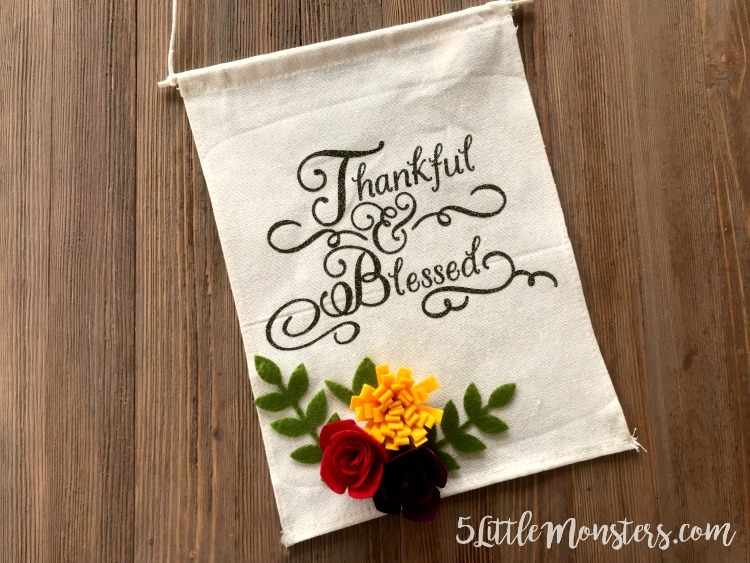 So I looked around and saw my packs of Cricut felt, one of the packs had some pretty fall colors in it that I thought would be perfect for some flowers to put on the bottom of the banner. 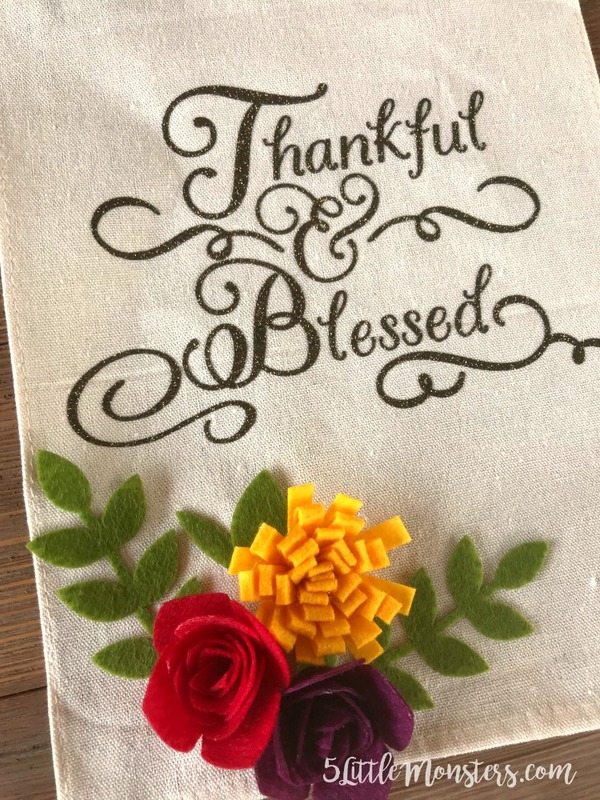 I glued the flowers in the corner, but I think they would also look nice centered under the words. I thought they just added a little something extra to the wall hanging. You could hang it up on your wall, or on your door. 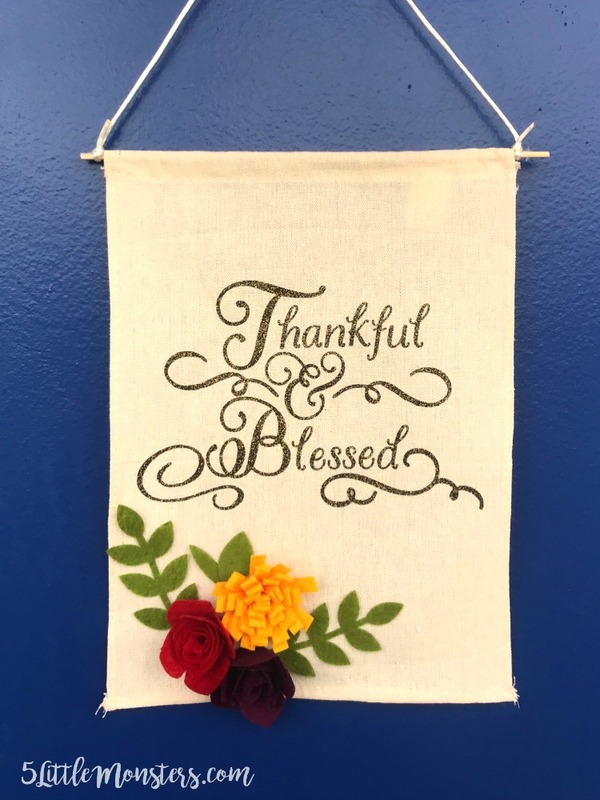 Open the design in Cricut Design Space. Cut it out using the fine point blade and the green mat to cut the words from the glitter iron on, don't forget to mirror your design. Use the rotary blade and the pink mat to cut the flowers and leaves out of felt. Press the words onto the banner, leaving room to put the flowers below the words. Assemble the flowers. For the red and purple flowers just roll the flowers, gluing as you go, starting from the outside of the shape, when you get to the end glue the center circle to the bottom of your flower. For the yellow flower fold the long strip in half and roll. I started from the smaller end and rolled to the longer end although I honestly have no idea which way is correct. Then I glued the rolled flower to the other flower piece and spread the petals out a little bit. I figured out where I wanted to place the leave and flowers and glued them in place.